Pierre & Léontine Hoyez-Berger, Brussels. Given to the present owner's aunt by the above in 1949. Letter from Magritte to Salkin, 2 Jan. 1947. Letter from Magritte to Andrieu, 20 Dec. 1947. D. Sylvester (ed. ), René Magritte Catalogue Raisonné, Gouaches, Temperas, Watercolours and Papiers Collés 1918-1967, London 1994, vol. IV, no. 139, (illustrated p. 324). Brussels, Galerie Dietrich, Magritte, November-December 1946, no. 10. 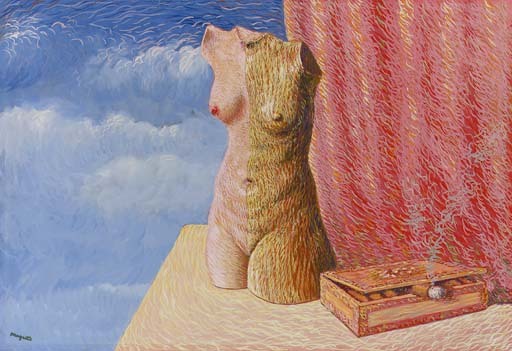 New York, Hugo Gallery, René Magritte, April 1948, no. 37 (not shown). 'The image was originally called 'High Society' (Le grand monde), but the title has been changed because there was a possibility of it being interpreted as a satire on high society through the presence of a box of cigars. (René Magritte, Titres, 1947, quoted from D. Sylvester, René Magritte, Catalogue Raisoné, vol. IV, p. 324.